Do You Understand the Termination Provisions in Your Construction Contract? There are boilerplate termination clauses that are commonplace in construction contracts permitting the property owner or the contractor to get out of an agreement based on a limited set of circumstances. Knowing the mechanics of how each type of termination provision works will aide parties if termination must occur. For Cause, For Convenience, and Force Majeure clauses are a few of the clauses parties frequently use in construction-based contacts. These clauses and its function are discussed below. The For Cause termination clause is one of the most basic types of termination clauses parties will agree upon. A For Cause clause in a termination provision provides that if any one party breaches the contract, the contract is no longer valid. Depending on the severity of the breach, the aggrieved party has the right to withhold performance or payment. At this stage, one party will assert that the circumstances are so egregious as to release him or her from obligations under the contract. A classic example of For Cause termination relates to timing. If a contractor agrees to furniture materials and begin construction by a stated date and does not fulfill the end of the bargain, there is a good argument for breach of contract and For Cause termination. As discussed above, the severity of the breach always solidifies whether a breach occurred. In the above scenario, if the work has not commenced for many weeks, then the more likely the lack of commencement serves as a For Cause breach. Termination for Convenience permits either party to terminate the remainder of the contractual period without cause or fault on any side. If a contractor does not possess the manpower to complete the remainder of a construction project, then the owner of the property can terminate the contract on the basis of Convenience. In this case, the owner of the property will not interpret non-performance as a breach of the contract. Here, the owner has the option to terminate the contract without paying any remaining balances. Parties must write a For Convenience termination clause into a contract for it to possess validity. If the term is not stated in the contract then in the scenario above, the owner is obligated to pay the remaining balance under the contract. A Force Majeure termination clause calls for an end to all contractual obligations for both parties in the event of acts of nature, natural disasters and war. The Force Majeure clause is also known as the “Acts of God” clause. Therefore, the act must be severe enough to render the performance almost impossible. Due to the nature of this provision, the circumstances permitting termination based on Force Majeure are usually unforeseeable and unavoidable. For example, if a hurricane passes through an owner’s home and completely damages it, it would be difficult for a contractor to complete an addition to the home. All construction-based contracts must include a Force Majeure clause. 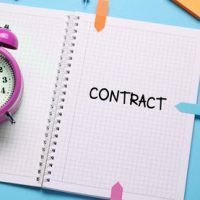 A well-drafted construction contract is the first step to a successful and dispute-free constructional relationship. Florida attorney Brendan A. Sweeney is a dedicated construction law attorney with years of experience advising on complex construction issues. He has years of experience drafting and negotiating the best contract deals on behalf of his clients. Attorney Sweeney will ensure that your rights and responsibilities are clear and that your needs are well represented in the contract. Contact us now for a consultation.